Please click here to go directly to our Synthetic Equity article in PDF. I. Defines synthetic equity in the context of attracting, retaining, and rewarding key talent; Key executives can't afford to buy in and we may lose our best people." IV. Provides a case study illustrating the power of synthetic equity. Do you want to do a better job building a talent pool, rewarding high performance, optimizing cash and empowering succession? Consider employing synthetic equity solutions in your organization. Many business owners feel that they are suffering from the scarcity of talent, scarcity of cash, and scarcity of confidence in their business succession plan. 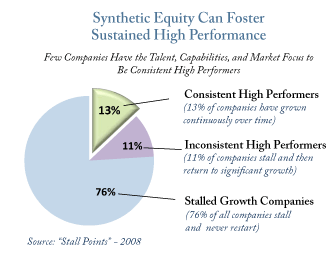 An integrated executive compensation plan including synthetic equity can help to achieve consistent high performance. "High Performance is the consistent and enduring surpassing of peers in revenue growth, profitability and total return to shareholders, across business and economic cycles, often across generations of leadership, measured by widely accepted financial metrics." So what is the best incentive structure to reward senior executives who have the “genius” to create and maintain a high performance organization? Most business owners are familiar with true equity plans like employee stock options and restricted stock which are common for publicly-held and venture capital backed companies with a broad shareholder base. However, true equity plans often do not fit the owner’s objectives or the capital structure of a privately-held company. In these instances, synthetic equity incentive plans can be a far superior approach to foster high performance. Synthetic equity is an executive compensation program granting an executive with the right to a defined amount of enterprise value with no buy-in cost to the executive. Unlike most equity plans, synthetic equity plans are highly versatile and can be tailored to meet the value sharing requirements of who gets what and when and under what circumstances. The list can go on. Practically, synthetic equity is the executive compensation “clay” that can be malleable into almost anything a business owner wants it to be. It can go from a tracking stock to pure pay-for-performance. Of great importance to business owners, synthetic equity is NOT governed by the company’s shareholders’ agreement and related buy-sell terms – therefore there is a great amount of flexibility especially related to payout. Synthetic equity agreements need to be compliant with the IRS code section 409A which defines the rules relating to the payout of these plans. According to 409A, payout is triggered for synthetic equity plans related to six permissible events or plan termination. The three unplannable triggers are death, disability, and unforeseeable emergency. 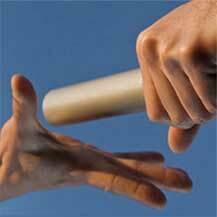 The three strategic triggers are change of control, time certain, and separation of service. Therefore, the business owner defines the timing when executives can monetize their value under the plan – which is different than a typical employee stock option plan where the executive will make their own decision as to when they choose to “exercise” their stock options. Bottom line: synthetic equity plans can offer business owners greater control and flexibility relative to plan design and payout. Based on capital structure, many businesses cannot or should not use traditional equity plans such as stock options or restricted stock. Rather, synthetic equity should be the de facto approach to design value sharing arrangements for the senior executive team – especially for a privately-held company. Take for example a hypothetical rapidly growing multi-regional environmental consulting firm currently organized as an S Corp. The three practice groups (East Coast practice, West Coast practice and Canadian practice) have different competencies. To attract, retain and reward key talent, the owners are considering adopting a tiered-LLC structure in which each regional practice head receives some direct ownership of newly created regional entities. While well intentioned, this reorganization may be very burdensome. The "drop-down LLC" capital structure could be a taxable transaction; furthermore annual tax returns are likely required by LLCs. Respecting separate organizational structures requires greater accounting and legal costs. Most importantly, synergy, collaboration and strategic flexibility across the overall company may suffer due to multiple entities. Alternatively, the vast majority of the rewards structure could be achieved via a synthetic equity tracking value solution — without any of the "friction" of the true equity solution. Maintaining single tax return for a company with multiple divisions (see example above). 100% ESOP-owned S-Corps seeking to retain tax exempt status. A 100% S Corp ESOP is fully tax exempt. However if the S Corp has other equity owners, the pass-thru S Corp may need to make tax distributions to all shareholders – causing significant dollars to leave the S Corp. Synthetic equity often plays a critical role in many ESOP situations such as providing synthetic equity upside in exchange for founder/seller financing. S Corporations seeking to maintain their S status with fewer than 100 owners. S Corps are only permitted to have 100 owners. If an S Corp already has a large number of shareholders, synthetic equity may be the only approach to achieve a significant executive value sharing program without compromising the S election. Owners seeking to transfer a significant portion of their business to a family trust for estate planning and tax reduction purposes. Owners may intentionally take certain actions to complete an estate planning strategy (e.g., recapitalization, redemptions, and distributions). However, the estate planning strategies become much more difficult to achieve if there are non-family members owning company stock. Efficient owner transfer often favors synthetic equity over true equity solutions. Owners seeking to transfer ownership among founders or major shareholders. Rebalancing ownership in a closely held business is significantly less complicated if there are no other equity owners. In one case, we redeemed 90% of the stock in an S Corp to finesse an agreed-upon low-cost buyout of a departing owner. Owner to owner transfer strategies are much easier without true equity in the mix. 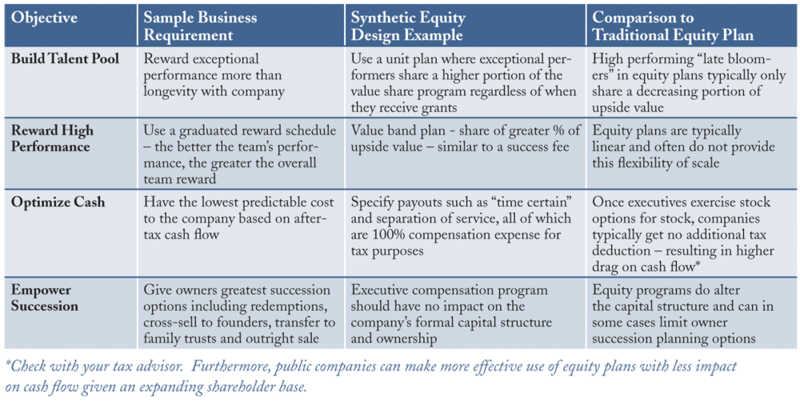 The table above is a hypothetical illustration of the potential benefits that can result from customizing executive compensation plans to align with business objectives. With long-term executive compensation often expressed as a 10-25% share of overall company value, the executive compensation reward program may be one of the single largest investments a business owner ever makes. Many companies do regularly benchmark the fairness of the overall compensation packages (e.g., “we give our CEO 5% of the company upside - which is fair given competitive pay packages for our peer group”). Benchmarking itself is not enough – good planning means meeting and exceeding business requirements and this is where synthetic equity can excel. Synthetic equity provides literally hundreds of design options across the plan life cycle to best facilitate meeting the business’s requirements. The plan lifecycle includes (a) plan grants, (b) service period/vesting, (c) value determination, and (d) payout. Integrated planning across the program lifecycle can result in superior plans given business owners’ objectives. The flexibility of synthetic equity is especially powerful in S corporations. 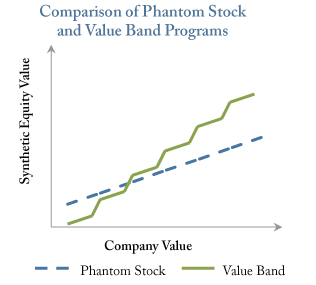 Without synthetic equity, certain traditional plan designs could result in a second class of stock and termination of the company’s S election. "My executive compensation program is a mess. Our legacy management makes too much and our new leaders are upset that they do not share in the increasing company value. We have an employee stock option program – but as the company has grown from $70M to $300M in value, very few executives have the cash to exercise the options for stock. As a result, many of the options expire worthless – making our program feel like a “tease”. Due to new requirements, we need to disclose the pay packages for our top five executives (required as a government contractor) and I fear the inequality of the pay packages will further stir the pot. Furthermore, at 68 years old, I will be stepping down in three years and I do not have succession management squarely in place. Our top management and my co-owners all want ACME to be a perpetual company and I need a plan that gives me the most options to satisfy our family estate planning and the needs of future leaders. We implemented a minority ESOP over the last few years and the new plan needs to be ESOP friendly. Can you help?" The sentiment shared by the business owner above is all too common. Many business owners feel that they are suffering from the scarcity of talent, scarcity of cash, and scarcity of confidence in their business succession plan. An integrated executive compensation plan including synthetic equity can certainly help to achieve consistent high performance. In the ACME case above, the advisors designed an integrated business succession plan supported by a new executive compensation plan. Owners, next generation leadership, and advisors clarified the business requirements across talent, performance metrics, cash flows, and succession. A meritocracy performance-based pay plan was implemented to replace the employee stock options and high annual cash compensation for select legacy leaders. 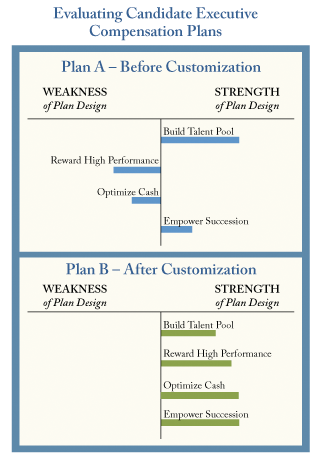 The advisors and owners froze the employee stock option plan and replaced it with two plans: a value band unit plan for the company leaders where 1/3 of the value pays out in 6 years – giving succession leadership a strong team unified target. The remaining value is paid out upon the earlier of a separation of service or change in control. Secondly, a cash-settled SARs plan using a 10 year time certain payout to incent long-term performance across the top leaders was established. Overall, the plan was customized to meet the 3, 7, and 15 year time horizon reflecting the needs of the current major owners, succession management, next generation of leadership, and the ESOP itself. Working across multiple disciplines, the executive compensation plan was integrated with the owner’s estate, gifting and philanthropic planning. The advisors stress-tested the plan via scenario planning, considering the likely and extreme outcomes around the pre and post-tax cost of the program. The combined executive compensation plan, exit sale to the ESOP, and management succession plan collectively gave the various stakeholders confidence that the company’s high performance culture would continue once the next generation of management began to lead the company.